Professional counselors see clients who are struggling with various interpersonal issues and help them overcome them through different therapy techniques. This rewarding field includes many subdivisions, and counselors typically specialize in niche areas of their profession. These specializations include school and career counseling, addiction counseling, marriage and family therapy, mental health counseling and rehabilitation counseling. Counselors also vary in their preferred methods of therapy delivery. Some primarily counsel clients in a one-on-one setting, while others provide therapy to couples, families and large groups. A master's degree in counseling is the minimum education level for most counseling jobs, and counselors who offer services in private practices or public schools must also earn full licensure in all 50 states. However, a bachelor's degree in counseling is a critical first step for those who aspire to a career in this profession. Programs typically include degree specialization or concentration options, as well internship or residency courses. Many of today's students are choosing to earn their bachelor's degree in counseling online. The best online bachelor's in counseling programs follow the same rigorous curriculum as brick-and-mortar options, and the self-paced schedule of most online degrees is ideal for students with part-time jobs, childcare duties and other commitments that may interfere with campus-based learning. Learn more about what you can do with an online bachelor's degree in counseling and what kind of career opportunities you can look forward to with this comprehensive guide. WILL AN ONLINE COUNSELING DEGREE PROGRAM PROVIDE ME WITH THE SKILLS I NEED TO ADVANCE MY CAREER? An online bachelor's degree in counseling will introduce the fundamental theories and methods that currently guide the counseling profession. Courses will cover topics like psychology, mental health and behavioral disorders, human growth and development and empirical research methods, as well as laws and ethics for licensed counselors. Internship and residency courses also enable students to visit active worksites and receive supervised training from experienced professionals. The best online bachelor's in counseling programs will also prepare students for post-graduation requirements, such as licensing exams. WILL AN ONLINE COUNSELING DEGREE PROGRAM WORK WITH MY SCHEDULE? Online counseling bachelor's programs offer a flexible alternative to traditional classroom learning. Students can access course readings and lectures, submit written assignments, take exams and communicate with their professors at the click of a mouse. Current technology also enables them to study away from the home computer using a laptop, tablet, smartphone and other Wi-Fi-compatible devices. For added convenience, online counseling students can usually coordinate internships, residencies and any other onsite courses at locations near their current address. WHAT JOBS CAN I GET WITH MY BACHELOR'S DEGREE IN COUNSELING? Although some entry-level jobs at counseling centers may be available, a bachelor's degree will not be sufficient for most counseling careers. Many counselors earn a master's degree ― and in some cases, a Ph.D. ― before entering the workforce, and those who plan to offer private practice services must complete all licensure prerequisites for the state where they plan to work. However, the Bureau of Labor Statistics (BLS) notes that a bachelor's degree may be adequate for those with career plans in substance abuse counseling. College graduates with a bachelor's in counseling may also be able to land jobs in fields related to counseling, such as social work or human resources. WHAT ARE THE BEST ONLINE BACHELOR'S IN COUNSELING PROGRAMS? Choosing a program is an incredibly personal decision, and only you can properly evaluate whether a target school's strengths match your educational needs. The following ranked list of schools should serve as a helpful starting point in your search for the best online bachelor's degree in counseling programs in the United States. 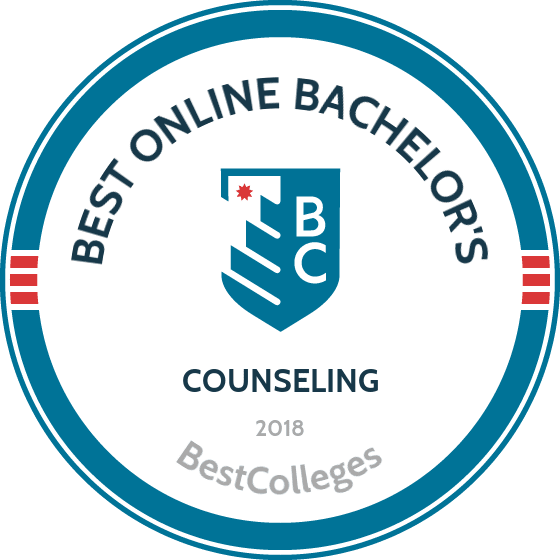 If you are considering an online bachelor's in counseling, be sure to contact admissions specialists at different colleges and universities to learn more their about specific bachelor's degree requirements and offerings. Liberty is a private, nonprofit university that has administered distance learning programs since 1985. The Christian university offers a BS in psychology with an emphasis in Christian counseling. The online counseling degree requires 120 credit hours and prepares students for careers in areas such as advocacy and community relations. The Christian counseling emphasis comprises nine credit hours, and students undertake a three-credit internship. Students complete Liberty's general education curriculum, which includes courses in Bible study and philosophy, prior to beginning major coursework. The university delivers online classes in eight-week sessions and does not require students to log on at specific times. Online students can take one-week, intensive courses at Liberty's campus in Lynchburg, Virginia. Students must earn at least 30 hours through Liberty. Clarks Summit University is a Christian institution based in Pennsylvania. CSU offers online programs to students across the country. Distance learners can earn their bachelor's degree in counseling online without any campus visits. The 123 required credits include Christian general education courses that cover theology, Bible study, and the humanities. Major courses explore topics such as abnormal psychology, contemporary theories in counseling, marriage and family dynamics, and social psychology. Online courses at CSU begin five times per year, allowing students to enter the program at the most convenient time for them. Students in the BS in counseling program complete online coursework asynchronously. Located near West Palm Beach, Florida, Hobe Sound Bible College provides flexible online programs for working professionals. Each of HSBC's programs emphasizes the individual, the Bible, the intellect, and the broader community. HSBC students earning their bachelor's in counseling online gain foundations in psychology and theology. The BA in counseling program requires 129 semester hours, including general education courses, Bible courses, and major courses. Students can work with an advisor to select an optional minor. Major coursework provides a foundation in counseling through classes in marriage therapy, crisis intervention, and group counseling. Students complete general education courses in evangelism, philosophy, and literature. The University of Cincinnati provides one of the best online counseling programs for students wanting to pursue a career as chemical dependency counselors. Its online counseling program is focused on substance abuse counseling; upon graduation, students are qualified for Ohio licensure and national certification. Students earning an online counseling degree can expect to learn from nationally-recognized faculty and experienced practitioners. Courses range from Group Skills to Case Management; UC students can expect a high caliber of education. U.S. News & World Report ranked UC among the “top tier of Best National Universities”. The school is known as the global birthplace for co-operative education, an educational model which alternates semesters of traditional education with semesters working full-time in their professional field. Northwestern State University of Louisiana offers two online counseling programs in psychology with a concentration in prevention specialist and psychology with a concentration in substance abuse. While they require the same base psychology courses, the different concentrations include four required electives specific to each emphasis. The university also has an online counseling degree in addiction studies. Upon graduating in their emphases, qualified students can apply for state certification or licensure as an addiction professional. NSU is located in Natchitoches, Louisiana and was established in 1884 in an old mansion. Three columns remain from the original structure, making it the oldest continually occupied site for higher education in Louisiana. Its online program eNSU is the state’s first and largest electronic campus. Online students are not charged out-of-state fees; that’s one reason NSU was ranked the fourth most affordable online college for 2016. Toccoa Falls College is a private Christian institution that offers online associate and bachelor's degrees. TFC's online BS in counseling psychology program includes general education courses in the Bible and theology. Students earning the counseling degree online complete 126 hours of coursework in topics such as the New and Old Testaments and Christ-centered counseling. Major courses comprise 42 hours and includes classes such as personality theories, family therapy, and developmental psychology. The program culminates in a counseling internship or a psychology research project. Transfer applicants with more than 12 previous hours, not including dual enrollment credit, must submit a personal testimony and transcripts from all previous colleges. Freshman applicants must submit high school transcripts, a personal testimony, and standardized test scores. Johnson University is a Christian University with campuses in Knoxville, Tennessee, and Kissimmee, Florida. Its pastoral care and counseling major teaches cultural sensitivity, counseling through ministry and pastoral services, and family, conflict, and community counseling. For students interested in an online counseling degree with a scriptural emphasis, Johnson University is a great option. Besides earning your counseling degree online, you can grow personally and professionally through Johnson’s online courses. The university offers forums for community discussion and internships for real-world experience. It’s ranked in the top 20% of all colleges and universities nationwide as a military-friendly school. Drexel University enrolls more than 15,000 undergraduate students, more than 4,000 of whom take courses online. Drexel was the first major higher learning institution to have a completely wireless campus and was the first to offer a mobile web portal service. Drexel offers a fully online counseling degree; the BS in behavioral health counseling program requires of 180 quarter credits. The university structures the program in 10-week quarters, allowing students to complete classes quickly. The curriculum includes general education courses and core classes in areas such as counseling theory and practice, addictive disorders, and ethics and professional responsibility. Elective options include genetics and mental health, psychopharmacology, and trauma-informed care. Transfer applicants must have earned at least 24 previous college credits with a minimum 2.5 GPA. Freshman applicants must have graduated high school at least two years prior to applying. Southwestern Assemblies of God in Waxahachie, Texas (south of Dallas) offers chapel worship services Tuesday through Friday, which also streams on SaguTV on demand for students who cannot attend. Sports, student cinema, and seminars are all streamed on SaguTV for students and faculty to benefit from. SAGU also offers two excellent online counseling programs in community care and counseling, or counseling with an optional minor. Community care and counseling includes internship opportunities in pastoral leadership or field practicum, while the counseling major offers traditional counseling courses for working outside of the ministry. SAGU online counseling degrees offer credit for experience; any students who enroll in three-hour experiential learning credit course have the opportunity to earn up to 45 hours of credits for knowledge and work experience. This can save you thousands annually and increase your return on your educational investment. Bay Path offered the first all-women, fully online bachelor's degrees in the country. Bay Path's online platform, the American Women's College, offers asynchronous online programs and on-campus weekend classes at the Bay Path campus in Massachusetts. Students complete the online counseling degree in accelerated, six-week terms, which allows students to earn the degree quickly. Major coursework includes classes in social psychology, counseling diverse populations, and adolescent development. Transfer students can apply up to 90 previous credits toward the counseling degree, and Bay Path awards credit for professional and military experience. The university offers six start dates per year, and students can enroll part or full time. Students can complete degree requirements entirely online or in a hybrid format. Grace College is an evangelical Christian college located in Winona Lake, Indiana with an online counseling program. Grace emphasizes putting Christ above all and focuses on individual growth as a preparation for service and careers. Its campus has clubs focused on service, intramural sports, music, and international cultural awareness. Grace College's online program offers an online counseling degree in human services. It’s a degree completion program that can be finished in as little as 16 months. Students can start in fall, spring, or summer and have specific curriculum maps tailored to their chosen start date. The counseling degree online features adult assessments instead of traditional examinations. It is also part of the college’s GOAL (Grace Opportunities for Adult Learners) program, which is designed for adult students balancing other commitments, and has a lower tuition rate than other degree completion programs. Located in beautiful Tulsa, Oklahoma, Oral Roberts offers 13 online degree programs, including an online counseling program focused on Christian caregiving. This counseling degree online prepares students for counseling within local churches and ministries, helping others focus on wholeness in every area of their life: spirit, mind, and body. Students can choose electives within the major that apply to their professional interests; the program finishes with a senior practicum or paper. ORU has a high retention rate, with 80% of students returning to continue their studies. Its student base represents all 50 states and 89 countries, and hundreds of students participate in short-term mission trips to five different continents. While around 3,000 students attend classes on campus at Indiana Wesleyan University-Marion in Marion, Indiana, more than 10,000 study online. Its online counseling program in addictions counseling is a 22-month degree completion program that is completed entirely online, except for the practicum during your senior year. IWU is one of the best online counseling programs because of its online flexibility combined with real-world experience in the practicum. The largest private college in Indiana, IWU campus has beautiful buildings that were mostly constructed in the last 25 years. For online students wanting to visit or take some courses on-campus, its location is only an hour from Fort Wayne or Indianapolis. Its excellent student experiences both on-campus and online make IWU a great place to earn your online counseling degree. Hope International University is a private, Christian institution based in Fullerton, California. HIU has satellite campuses in Anaheim, Washington state, and Nebraska. HIU students complete general education courses that emphasize the humanities and the Christian worldview. The bachelor's of science in human development program requires a leadership and ethics core and offers an optional concentration in counseling. Core coursework explores topics such as the history and literature of early Christians, servant leadership, and philosophy. The online counseling degree requires 120 units, including 46 units of major coursework. Students pursuing the community mental health and counseling concentration take classes in areas such as counseling theory, abnormal psychology, and career counseling. HIU delivers online courses asynchronously, so students can complete coursework at their convenience. Based outside Tampa, Saint Leo is the oldest Catholic college in Florida. The university enrolls thousands of students in its fully online programs. Saint Leo offers a bachelor of arts in psychology with an emphasis in clinical counseling that prepares students for careers as case workers, human resource generalists, and child welfare workers. Students pursuing the online counseling degree gain the skills necessary to pursue positions as marital counselors and roles in community organizations, such as Veterans Affairs. Saint Leo accepts applications on a rolling basis and offers six start dates throughout the year. The university awards credit for military courses and training, police training, nursing, and other types of professional experience. John Wesley University is located in High Point, North Carolina and offers an online counseling program. The university was founded in 1993 and is an interdenominational Christian university. It is one of the best online counseling programs because of its low student-to-faculty ratio of 10:1 and the lowest tuition of any private liberal arts college in North Carolina. John Wesley offers a high-quality Christian counseling major. Their online writing lab provides editing tips and tutoring on the writing process via Skype and FaceTime. Students earning a counseling degree online from John Wesley University will graduate with the skills and knowledge to help others heal and grow through personal counseling. At University of the Cumberlands, online counseling program students earn their bachelor’s in human services, a field of study which strengthens your own values and self awareness as you learn about appreciating and helping others. Students in the counseling degree online program learn about professional helping skills, behavioral theories, and ethical practices, and will be prepared for a career as a counselor or probation officer. University of the Cumberlands is located in the green rolling hills of Williamsburg, Kentucky. It offers 27 sports, campus ministries, and unique intramurals and clubs. Online students can enjoy flexible learning, eight-week accelerated programs, multiple start dates per year, and refined curriculum designed for a smooth transition to the workplace. One of the best online counseling programs is offered by the University of South Dakota. Its addiction studies degree is an online counseling program that often qualifies to meet standards for state, national, and international certification. USD’s competitive tuition is offered to all students, whether in-state or out-of-state, on-campus, or online. The same prestigious faculty who teach on campus also teach their online courses. In addition to learning online, students can participate in intramural sports, sororities and fraternities, and a variety of clubs all offered at the beautiful campus in Vermillion, South Dakota. The university has a 97% job or graduate school placement and more than 10,000 students enrolled. Ohio Christian University helps students make a lasting impact with an online counseling program in substance abuse counseling. OCU’s online and onsite formats, relevant coursework, and affordable tuition make it easy to reach your dreams of helping others. The online counseling degree is designed to meet the necessary 180 hours of chemical dependency education for Ohio state licensure. Upon graduation, many students participate in supervised counseling at a treatment facility and take the licensure test to receive their license. OCU is located in Circleville, Ohio, but it has additional locations throughout Ohio and Georgia. Its student-to-faculty ratio is a low 10:1, with undergraduate, graduate, adult, online, and high school students. On-campus activities include athletics through the NAIA division, gospel concert series, and golf tournaments. Crown College offers two online counseling programs in alcohol and drug counseling and psychology/counseling. These are some of the best online counseling programs because of the unique curriculum that many other schools do not cover until the master’s degree level. Crown College’s online counseling degrees focus on skills-based training from a Christian perspective, with focuses in human behavior and development, addiction response, ministry, social work, and other topics. Tuition is significantly lower than at other universities, with 98% of students receiving student loans, scholarships, and financial aid. On campus students participate in the local community on campus and in the town of Saint Bonifacius, Minnesota, just west of Minneapolis. The college was ranked in MONEY Magazine’s list of 50 Colleges that add the most value and placed in the top 15% of their “Best Colleges” list. At Lee University, students can learn from the online program in ministry leadership, with a counseling emphasis. This online counseling degree includes the religion and general education cores, along with advanced theology classes and eight courses in counseling and psychology to complete the emphasis. Undergraduate ministry students receive a tuition discount of $202 per semester hour. Lee is located in Cleveland, Tennessee -- less than 30 minutes from Chattanooga and 20 minutes from the Ocoee River. It was ranked “Best in the Southeast” by the Princeton Review. Its campus has more than 100 clubs and dozens of study abroad programs worldwide. The university is known for its flexible learning with online learning, adult learning, and satellite campus options for students. Dallas Christian College offers FLEXCampus for distance learning students who want to learn through an online counseling program. Majors include psychology or psychology and the Bible; both include a heavy emphasis on pastoral counseling and counseling methods. These counseling degree online programs are designed for incorporating psychology theories into pastoral counseling. DCC is located in Dallas and offers its students athletics, chapel services, Kingdom Week (which emphasizes mission trips to other cities and countries), a day of service instead of classes, and residence hall devotions. Student clubs include government, flag football, ministry, drama, and the urban team, which serves impoverished neighborhoods in urban Dallas. Online students can access the career database, interact with students and professors through web conferences, and customize their classes for the schedule that works best for them. EWU’s online counseling program is a degree completion program in addiction studies, offering the required course to become a certified Chemical Dependency Professional in the state of Washington. Courses like relapse prevention and adolescent addiction assessment & treatment focus on issues of substance use disorders to help students learn how to help others improve their lives. Additional areas of study include a minor in addiction studies counseling and prevention, and a certificate in suicide assessment, treatment & management. Graduate programs include two graduate certificates, and a master’s of addiction counseling will be offered soon. Located in Virginia Beach, Regent University awards degrees up to the doctoral level. Regent is a Christian institution and offers an online BS in psychology program with a concentration in clinical and counseling psychology. Students gain experience with interviewing and counseling techniques and improve their problem-solving and decision-making skills. The program requires at least 120 credit hours, including 49 general education hours and 36 hours of coursework within the psychology major. Students in the clinical counseling concentration take courses in areas such as case management, treatment planning, and psychological assessments. The online counseling degree requires a capstone seminar that emphasizes Christian thought and practice. Trinity College is a private Christian college based on the Gulf Coast in Florida, and it offers a bachelor of arts in psychology with a concentration in counseling. This degree is available both on-campus and online through the Trinity Quest program, and it prepares students to either work in counseling directly after graduation or continue their studies in graduate school. Trinity’s counseling offering comprises 123 credits and aims to give students a basic understanding of major concepts, theoretical perspectives, empirical findings, and historical trends in the field of psychology. The degree also integrates Christian values with the psychology discipline, requiring 45 credits in Bible and theology courses. Applicants are recommended to have at least a 2.2 GPA, and a minimum 980 SAT score or 18 ACT score. They must also make a profession of faith, demonstrate Christian character, and attend church regularly. The application includes an essay, two reference letters, and a $35 fee. The counseling profession as a whole is expected to grow by a substantial margin between 2014 and 2024. This increase is due in part to the Obama Administration's Affordable Care Act (ACA); according to the U.S. Department of Health and Human Services, roughly 20 million previously uninsured Americans now have medical coverage. Under the ACA, mental health issues are to evaluated and treated the same way as other chronic diseases. An aging baby boomer population is also contributing to the demand for licensed counselors, particularly those specialized in clients with dementia and other mental health issues associated with elderly populations. According to BLS projections, more than 80,000 counseling jobs will be added over the next decade. The following table breaks down these BLS estimates for four of the most common counseling professions. These healthy job growth predictions have already translated into low unemployment rates for licensed counselors. The latest estimates from U.S. News & World Report found that substance abuse and behavioral counselors, marriage and family therapists and school counselors all face an unemployment rate of 3.3%. By comparison, the national unemployment rate for all occupations is currently set at 4.9%. According to the BLS, the median annual salary for all occupations in 'community and social service occupations' (including counselors) is $42,010. However, earning potential for counselors will vary by their career specialization, as well as other factors like educational attainment, licensure status and city/state of employment. The next table looks at salary expectations for common counseling careers at four different benchmarks. Of the five careers listed, school counselors experience the highest rate of career salary growth: 46.0% between the entry-level and late-career stages. However, the rate of growth was comparable between all five professions; the remaining four ranged between 30% and 42% salary growth after 20 years in the workforce. Although a graduate degree and full licensure will be required for most counseling careers, college graduates with a bachelor's degree in counseling will be qualified for numerous entry-level jobs in the field. Four common career pathways for counseling degree majors are outlined below. School and Career Counselors: Found in public and private schools at all grade levels, school counselors work with students to address and overcome personal issues related to their academics and home life. Elementary and middle school counselors primarily help students build fundamental learning skills and provide them with emotional support. At the high school and postsecondary levels, counselors generally support students through career and college planning advice. While most of these counselors work in school offices, some may find employment through companies that provide after-school counseling services. Mental Health Counselors and Marriage and Family Therapists: These counseling professionals help clients cope with a wide range of emotional and behavioral issues. They often observe and diagnose clients, and then provide the appropriate level of therapy. Mental health counselors specialize in various interpersonal issues, while marriage and family therapists mainly help clients tackle domestic issues. Substance Abuse and Behavioral Disorder Counselor: These counselors (also referred to as 'addiction counselors') help patients who struggle with alcoholism, drug abuse, gambling and other potentially destructive behaviors. Addiction counselors first help clients pinpoint 'triggers', or aspects of their life (such as work or family) that can lead to addictive spirals. They also support clients during the treatment and recovery phases. Rehabilitation Counselors: Rehabilitation (or 'rehab') counselors help clients who live with physical and/or emotional disabilities. These counselors support clients by helping them seek employment, take care of day-to-day tasks and otherwise maintain an independent lifestyle. Many rehab counselors specialize in niche groups, such as children/students or military veterans who have been wounded in action. Making professional connections and learning about different approaches to counseling is crucial to your success. Professional organizations offer a great entry point for students who want to learn more about their chosen career path. Below you'll find three of the country's most prominent organizations established for professional counselors. These organizations host networking events, provide online trainings, maintain active job boards, and offer other services for career-ready college graduates. American Counseling Association: Founded in 1952, the ACA is considered the world's largest professional organization for professional counselors, and has more than 52,000 current members. The ACA website features an extensive virtual knowledge center that contains information about licensure requirements, diagnostics, ethics, and other important areas of the field. Continuing education opportunities, journal publications, and an online job board are also available. American Association for Marriage and Family Therapists (AAMFT): The leading professional organization for counselors specializing in marriage and family counseling, the AAMFT represents more than 50,000 licensed counselors worldwide. The website features a job board and licensure links, an online information library, and a virtual networking center. This global organization (NAADAC for short) represents roughly 85,000 counselors, educators and other addiction-related personnel in the U.S., Canada and overseas. Member benefits include reduced rates on professional development courses, complimentary journal subscriptions and discounts for malpractice and liability insurance.